There are, in fact, umbrella lights throughout Epcot’s two-floor, Electric Umbrella restaurant, but they’re a little hard to see, when you’re sitting under them. 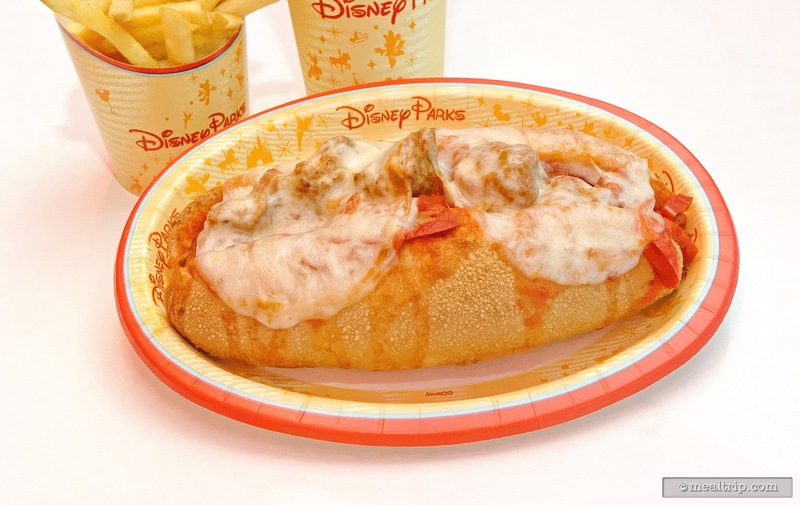 Counter service fare includes an unusual Macaroni and Cheese Burger, Meatball Sub, and Vegetarian Flatbread. Beverages including beer are available, along with a few dessert options. On a recent late-afternoon walk-by of the Electric Umbrella in Epcot's Future World, I noticed that a few of the indoor tables were available. It is a little unusual to find the Electric Umbrella quite so "empty"... table trolling with a tray of food is somewhat common. So I decided to try out the "French Dip Burger", an item that has long been associated with the Electric Umbrella. I had high hopes for this one. 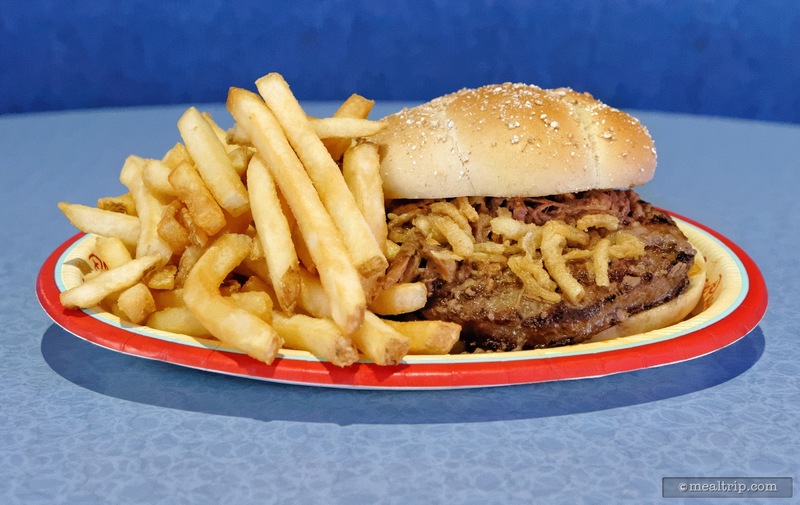 It's basically supposed to be everything you want from a good dippy, au jus and onion, meat sandwich… but without the actual au jus (because that would probably be a bit too messy in a high-volume theme park environment). So the idea is, there's Beef Brisket that's (supposedly) been simmering in the au jus… which is placed on top of a hamburger patty. Add to that some melting Muenster and top with Crispy Onions, and you should have a French Faux Dip Burger. The reason I had high hopes was two-fold. One… I've heard good things about this one. 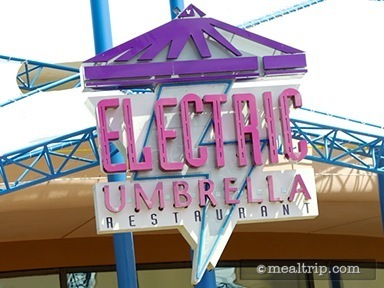 Many guests have said this is their favorite thing at the Electric Umbrella. Number two… I quite liked the Sausage and Pepper Sandwich on my last visit. It had flavor and heat, two things you don't always find at counter service dining locations. Unfortunately, the French Dip Burger seemed a little one-note. Not bad, not great... just okay. If there's four things listed on the menu description, I kind of want to taste or feel those four things in the finished item. The two meats used here (hamburger and Beef Brisket) seemed to be indistinguishable from one another. I have had the "counter service grade" hamburger at other Disney locations by itself however, and I can say the Beef Brisket made this burger better… but still not "great". The Crispy Onions weren't crispy enough to add texture, and not flavorful enough to add any difference you could taste. All of this puts a lot of pressure on the Muenster to deliver something… but sadly, what's on this burger was the correctly spelled Muenster (of American origin) and not an actual Munster (of French origin). If you know cheese, there is a difference. If you don't know cheese, the semi-soft Muenster used here was way too mild to be tasted, and melted so fast there was barely any evidence of it being on the burger at all. The fries (as is usually the case) were quite good… hot and crispy on the outside, pillowy soft on the inside. Interestingly, the burger also came with apple slices. I don't know if that was a mistake or the norm with this burger (it's supposed to be fries or apple slices)… but although packaged in a little plastic envelope… they were quite good as well. The price, seems high, but it's not out of line with other courter service burgers in Disney parks. I do think you get more flavor with the Sausage and Pepper Sandwich though, and it's 20% less than the burger. I would probably recommend that, over the burger, as long as you like hot (spicy) sandwiches. The service at Electric Umbrella is like most counter service locations at Disney… which is to say it's really slow when compared to a high-volume fast-food location outside the gates. At peak dining times, expect a trip through the ordering line to take the better part of 20 minutes. 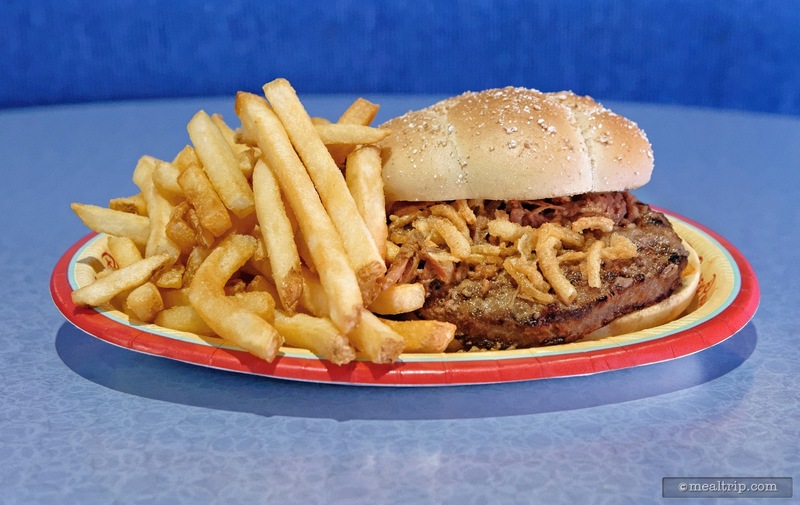 All in all, the French Dip Burger is about average when compared to other counter service burgers at Epcot. It's fine… but doesn't really have that culinary "wow" that would make me order it again on another visit. 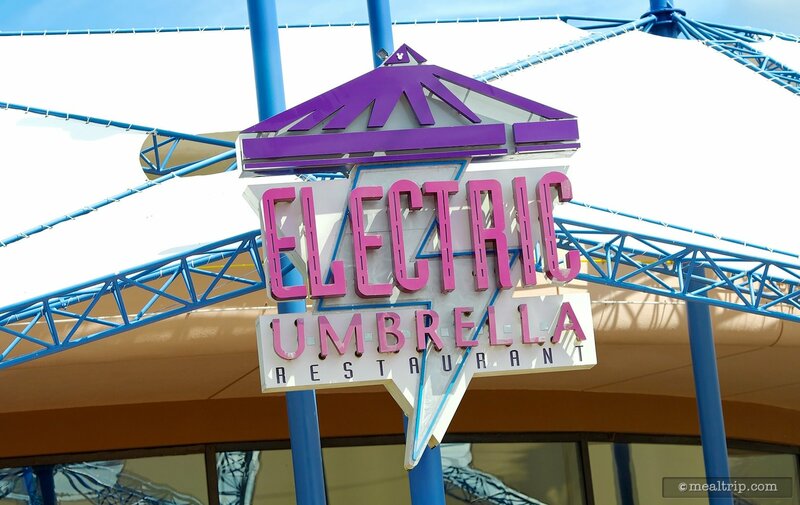 With so many great dining options at Epcot, I tend to overlook the Electric Umbrella, which is located in the Future World (front) section of the park. 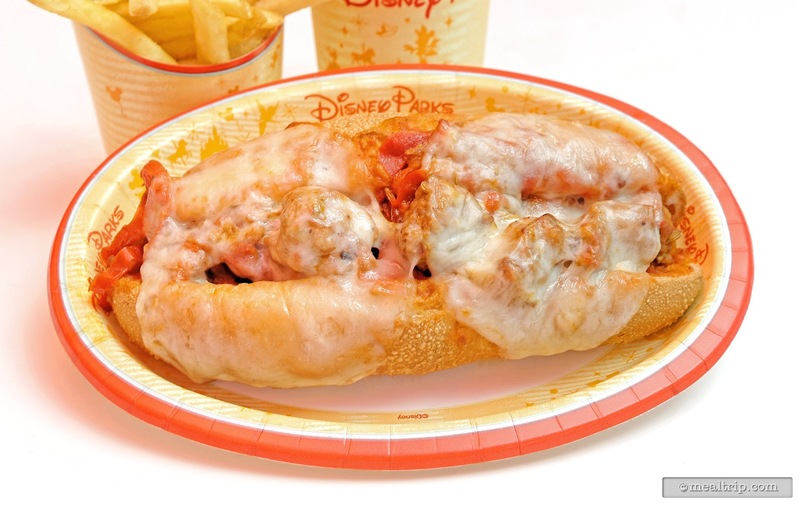 It just seems like a fast food location that I could find at any of the other Disney parks, and as such, I tend to pass it by for the full-service and more culturally themed restaurants at the back of the park. Recently though, I found myself with some extra time and no reservations for any other location, and I'm so glad that I stopped by the Electric Umbrella to try their Sausage and Pepper Sandwich. The Italian Sausage actually had a proper spiced up kick to it! In fact, the whole sandwich was very well balanced. The bread can usually make or break any sandwich item, and while it initially looked like there would be too much breading on this dish, that wasn't the case. It was packed full of (probably grilled or sautéed) peppers, onions, and a chunky tomato sauce. Because everything was covered with two melted slices of Provolone Cheese, you couldn't really tell how much "stuff" was in the sandwich. There were a total of four Italian Sausages (which were prepared "meatball" style) and enough of the peppers, onions and tomato sauce to keep the sandwich from drying out. While a side of grapes is available with the entry, I opted for the French Fries, because really… grapes??? The fries were great as well, but that's no surprise. The fries at most Disney counter service locations are hot and fresh. All in all, a really great counter service item, and worthy of a try if you happen to be hungry in the Future World section of the park!